By moving all of the boiler’s and technology under the counter, Modbar’s Espresso system eliminates the need for a mini coffee-creating wall between barista and customer, leaving only the group heads and steam wands on bar. This sometimes confuses coffee consumers who take the absence of a big machine on the bar to mean the shop doesn’t serve espresso. Next time you grab a pourover, check out the system just behind the Black Eagle and let us know what you think. Also, to see Modbar’s Espresso and Steam Systems in use, head south and see our friends over at The Boxcar of Moore! Just two short years after its invention in 1941 by Dr. Peter Schlumbohm, the Chemex coffee maker was (and still is) on display in New York’s Museum of Modern Art. Dr. Schlumbohm worked to make daily tools both more functional and more attractive. It’s great to have a coffee maker make great coffee, but it’s even better to have a coffee maker look great while also making great coffee. 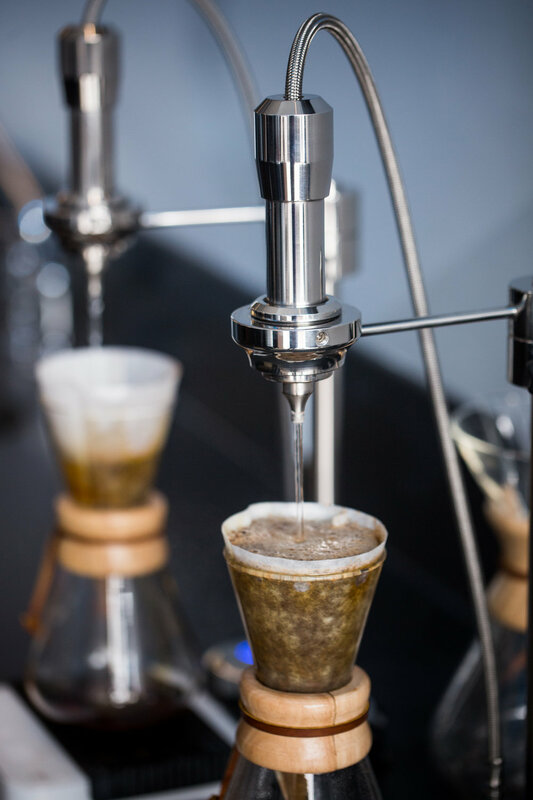 Aside from the design of the glass brewer, Chemex's double bonded filters are made to retain more of the fats and oils released in the brewing process than other types of filtration processes allowing for a cup that is cleaner and less acidic than a process using another type of filter. While it may give up a little body, it presents flavors more clearly, helping us live up to our name. Holding firm to the American way (Hello Imperial Measurements), Chemex brewers use 5oz Cups to designate sizes for their various purchase options. We’ve found that a 3 Cup brewer makes a great single cup option (about 300g), the 8 Cup brewer is great for 2 servings (600g), and the 10 Cup brewer works best for 3 (900g). We love to share our recipe and talk brewing with anyone who's interested. While using a glass brewer is beautiful way to brew coffee, sometimes retaining the high heat needed to brew the coffee can be an issue. That’s one of the reasons we use the Modbar pour over systems and also why our 3 Cup Chemexes behind the bar have leather covers around their bottom half. We love our Chemexes. If you’re looking for a way to make coffee at home, we’d really recommend giving them a try. We sell a couple different options alongside filters in store and on our online shop. If you have a brew method or recipe that you think makes a better cup, tell us! We love exploring all of the ways you can make great coffee at home. We've got a new coffee from Cat & Cloud Coffee Roasters on bar right now from Guji, Ethiopia. Some of our favorite coffees this year are from this region. They're always fruity, sometimes with exotic tropical fruit flavors, or simply juicy citrus and super clean like this one. More specifically, this coffee comes from one of the lesser known areas of Guji, called Shakiso. It's basically a giant forest of coffee trees, and it's a pretty dangerous place due to tribal clashes. The trees in Guji tend to be heirloom, so they're very uniquely Guji. The cherries are dense and grown under local Acacia trees. The conditions are perfect for excellent coffee: high elevation, good soil, generations of coffee-loving farmers, basically ticking every box on the good-coffee-checklist. Cat & Cloud has been one of our favorite roasters since the day they started. Check out this post we did the first time we featured their coffees here. We'll have this coffee on for the next couple of days, so come by and grab a cup.